This entry was brought from my Bellsouth Personal Web Page Diary. I created this piece between September 5 and September 27th. I made this pot for myself and it still resides in my backyard. Selected next project - an Azalea Pot. The pot and bowls were picked up at a garage sale a couple weeks ago. The pot has never been used. 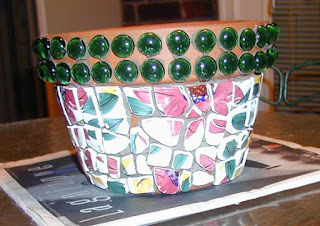 Selected pot, three flowered bowls and a handful, or so, of green glass gems to complete the project. Cut two bowls being careful to maintain circular flower pattern. Measured cut glass with pot to determine amount needed to make a complete circle. 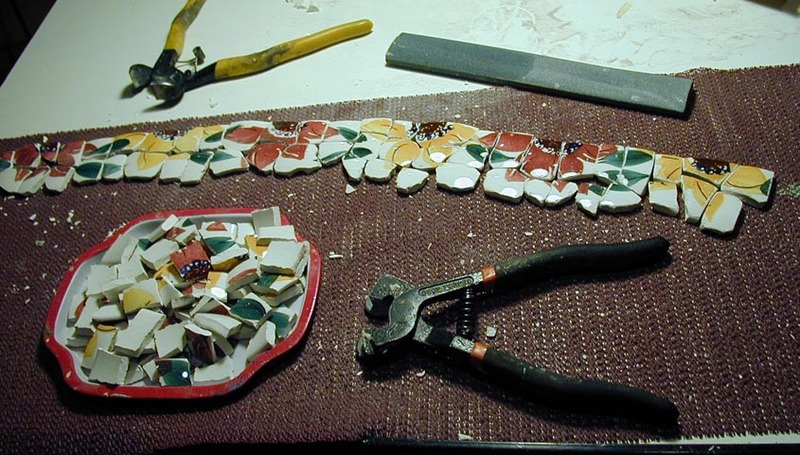 Cut remaining glass, and third bowl in medium size pieces. Nipped edges and deburred glass. It is not ready to go. Mixed a small amount of thin set morter and used to apply glass tessarae and green gems to the azalea pot. Set aside for several hours, and then the glass will be cleaned with a damp cloth. This lovely pot will have to cure outside for a few days (prior to grouting); it still reaks of sealant. a) Mixed small amount of white polyblend grout in a cup. b) Applied to Azalea Pot using hands and pallet knife, pushing firmly into spaces between glass shards and gems. Covered entire pot. c) With damp sponge, wiped grout from tops of glass shards and gems, until mostly clean (a slight haze remains; this is typical). d) Buffed glass and gems with soft cloth to remove haze from dried grout. This step takes places 30 or more minutes after completing the grouting. a) Poured small amount of "Impregnator" (A sealing product) in a cup. b) Put pot on small piece of styrofoam (to protect ledge under pot). c) Applied "Impregnator" with a small brush. 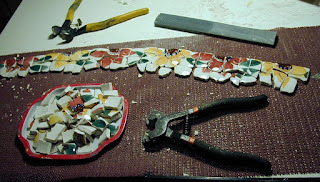 Applied two heavy coats, allowing the product to soak into the grout. d) Waited 10 minutes and then buffed glass and gems with a clean soft cloth. (If you allow most sealers to stay on the glass, it will form 'water spot' type deposits that are harder than 'heck' to get off. 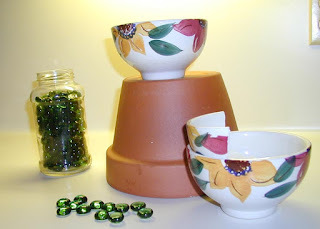 This is the end of the Azalea Pot creation. This pot will be maintained for personal use in my yard.